When I was 20 and a sophomore in college, I received a hot investment tip from a stockbroker. Without getting my dad's advice, I invested $500 in 400 shares. It couldn't go lower than $1.25 per share … or so I thought. Sometime later my dad found out and suggested that I use the stock to wallpaper my room! It would serve as a reminder to invest in stocks that are proven and to get my investment advice from a trustworthy authority. The Scriptures are the best, most proven, and most authoritative "Investment Tip Sheet" you'll ever read. Like having a copy today of the Wall Street Journal that will be published 40 years from now, the Bible tells you how to invest in your wife's life today if you want to experience a fabulous return in 40 years. And, by the way, as her stock goes up, you will share in the profits! Your wife needs your creative energies if she is to become all that God created her to be. To help you in this area, here are some of the best tips I know for giving both of you a rich return on your investment. Investment Tip #1: Treat her as a fully participating partner. Today the business world has all kinds of partnerships: silent partners, financial partners, equal partners, controlling partners, minority partners, and more. But in marriage, God intended for us to have only one kind: a fully participating partnership. The apostle Peter sets forth the concept of mutual partnership as he instructs a man to treat his wife as "a fellow heir of the grace of life." Although her function and role as a woman differs from yours as a man, she has an equal inheritance as a child of God. When you recognize your wife as a fully participating partner in your life and marriage, you build her esteem. If you exclude her from your life, you devalue her worth as a person and her identity suffers. Without realizing it, you send your wife an unmistakably clear signal that says, "I don't need you. I can live my life without you." Some husbands believe that the most difficult words to say are: "I love you" or "Will you forgive me?" But the three-word admission that seems the most threatening of all is, "I need you." A man may fear he will lose his wife's respect if he admits his need, but I've experienced quite the opposite. When I express my absolute need for Barbara, she is so built up and encouraged that she is free to respect me even more. I do not lose my identity as a man by expressing my dependence on her. "I need you to listen as I talk about what's troubling me. And I need your perspective on my problems and your belief in me as a person." "I need you to help me become the man God created me to be." "I want you to have total access into my life. I need you to keep me honest in areas of my life in which I could stray from Christ. You may question me or confront me on any issue." "You are the person I most trust with my life." "I need you for your advice, judgments, and wise counsel on decisions I face, especially at work." "I need your prayers for a temptation I am facing." I want to encourage you to let your wife into the interior of your life. Are you keeping her out of some area of your life? Do you tend to act independently of her in any area, including career or business. She may be more interested than you think. What about financial matters? She most likely will offer a perspective that you need to hear. A difficult office relationship? Her advice might solve the problem. Investment Tip #2: Protect her. 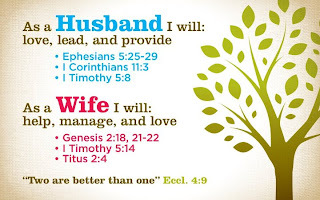 The apostle Peter also exhorts husbands, "You husbands likewise, live with your wives in an understanding way, as with a weaker vessel, since she is a woman." Peter's emphasis here is on "understanding" because she is a "weaker vessel." Your wife wants a man who understands her and her needs. Your wife needs to feel safe, secure, and protected. As her husband, it's up to you to provide that security. I was reminded of a woman's need for protection years ago when I attended a conference. During the event, a young woman was raped in her room. Later, when the speaker told the other conferees what had happened, I noticed an interesting phenomenon. Instinctively, and in unison, as though led by an orchestra conductor, nearly every husband in the audience tenderly slid his arm around his wife. Likewise, almost every wife slipped closer into his protective embrace. It was a physical gesture of a woman's need for safekeeping and a man's natural desire to protect his wife. Certainly, you already protect your wife physically. You wouldn't think of having it any other way. You discourage her going out at night if it is dangerous. You protect her by encouraging her to lock the car when she goes shopping. You talk about what to do if a stranger forces his way into the house. And you provide the kind of security she needs at home for the times you are away. All these statements and actions demonstrate that she indeed is valued and that you care about what happens to her. Overscheduling, letting her life get out of balance, and becoming driven? Others' manipulation of her emotions and time? Her own unrealistic goals or expectations, which set her up for failure? Her tendency to compare herself with others—where she repeatedly comes up short in her own eyes? Burnout at work? At home? The children, who would take advantage of her weaknesses that they know so well? People who repeatedly discourage her? Obviously, you can't protect your wife from every pressure, worry, fear, or loss. But you can do your best to anticipate many of these problems before they occur and to establish a solid security system for her protection. Investment Tip #3: Honor her. When God established marriage, He knew that one of the greatest components for building worth into another person would be honor. We see this in His command to each husband: "Grant her honor as a fellow heir of the grace of life." Webster defines honor as "high regard or great respect given; especially glory, fame; distinction." Every marriage is susceptible to leaks, and ours is no exception. The world lures my wife with glittery, false promises of fulfillment and true significance. If I fail to honor her and esteem her as a woman of distinction, then I ignore the reality of her need and the deceptive power of the world's promises. It's just a matter of time before she will begin to wear down and look elsewhere for worth. First, honor your wife by learning the art of putting her on a pedestal. If you focus on honoring her and caring for her needs, and on nurturing her as your most valued relationship, then you can truly make a difference in how she feels about herself. Capture your wife's heart by treating her with respect, tenderness, and the highest esteem. Second, honor your wife by recognizing her accomplishments. Frequently I look into Barbara's eyes and verbally express my wonder at all she does. She wears many hats and is an amazingly hard worker. At other times, I stand back in awe of the woman of character she has become. Her steady walk with God is a constant stream of ministry to me. Third, honor your wife by speaking to her with respect. Without careful attention, your tongue can become caustic, searing, and accusing. Washington Irving once said, "The tongue is the only tool that gets sharper with use." If your wife works outside the home, she has some unique needs for honor. She may need the practical honor of a free evening once or twice a week when you volunteer to do it all: Put the children to bed, clean the kitchen, do the laundry, etc. Fourth, honor your wife by extending common courtesies. You may think that these little amenities were worthwhile only during courtship, but actually they are a great way to demonstrate respect and distinction over the long haul. Common courtesy is at the heart of servanthood; it says, "My life for yours." It bows before another to show esteem and dignity. Investment Tip #4: Develop her gifts and horizons as a woman. First, help her grow as a Christian. Your wife is your number one disciple. Do you encourage her spiritual growth? It's the smartest thing you could possibly do. When your wife grows in this area, not only does she triumph at life, but you benefit as well. Help her to grow spiritually by praying regularly for her and with her—at bedtime, in the morning before leaving for work, at mealtimes. It will encourage her. Interact together over God's Word and its application to your individual lives, as well as to your family. Encourage your wife to employ her spiritual gifts in service to others outside your home if she has time. Second, develop her talents. Take part in her life by nurturing the development of her dormant talents. Like fruit seeds that never have been planted in fertile soil and watered, your wife's gifts may need your care in order to germinate. If you already have done this, you know that she responds to this personalized focus. She feels that you value her and are helping her to expand her life and utilize her gifts so that she might be even more productive. Perhaps your wife already has influence. Can you supply additional resources so that she can become even more effective? Third, help her develop new horizons. Most of us fail to anticipate major change points in the lives of our wives, such as the birth of a child, children's teen years, menopause, and the empty nest. When your children leave home, your wife will suddenly have enormous chunks of time and attention to devote to another worthwhile cause. Are you developing her today so that she will be ready to take some risks later? Investment Tip #5: Assist in problem solving. Isn't it interesting that, for most men, work gobbles up most of our most creative problem-solving energies, our best leadership, and our most noble attitudes? Home usually gets the leftovers. One of my friends has on his office desk a plaque that reads, "Save a little for home." Your wife would benefit if you saved a little more for home too. Start by considering this question: What one problem in your wife's life, if solved, would truly strengthen her? Is there a complete roadblock in the way or just a small boulder? How could you remove it? Watch your wife carefully. Observing her life may turn up problems that can be isolated and solved quickly. Discuss your alternatives together. Be sure to find out what your wife really feels is best in the situation. She may be too close to the problem, or she may know what needs to be done and simply need your leadership and backing to take action. Go to God in prayer. Ask Him for the wisdom and resources to solve the problem. Be careful of procrastination; make a decision under God's leadership and then help your wife to implement it. Evaluate the results. Inspect what happens. Refine the decision and its implementation through thorough analysis of how things are working out. Does your wife have an area or two in which she consistently fails? Time management? Budgeting? Meal planning? Problem solving at work or at home? You can help. By choosing to develop her in these areas, you encourage her growth so she can better handle the pressure. But you have a choice. Either develop her to handle the responsibilities or come alongside her to help accomplish the tasks. She needs you to help her become all God created her to be. Adapted from Dennis and Barbara Rainey's book Building Your Mate's Self-Esteem, published by Thomas Nelson Publishers. Copyright © 1995 by Dennis Rainey. All rights reserved. International copyright secured.